Every time i visit a website which supports unity webapp integration, a pop up dialog box out of the 'i' in the address bar appears which gets in my way and distracts me from what I am doing. I do not wish to click the always ignore drop down for every supported webpage, so is there a way to disable this notification box entirely (or even just uninstall webapp integration)? Open Firefox>Preference. In the "General" tab you see "prompt integration options for any website". Uncheck it and you're done. From this site - How do you disable these annoying popups in firefox. Webapps - I saw you can remove WebApps integration in Firefox by going to Edit > Preferences > Desktop Integration > Untick "Prompt integration options for any website". 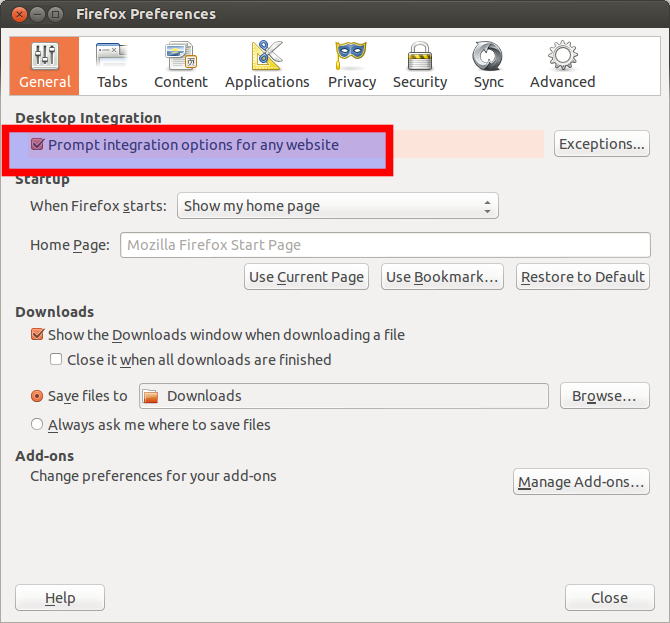 Or you can do it in Ubuntu preferences: "Alternatively (and for power users! ), settings can be tweaked over at dconf > com > canonical > unity > webapps." How can I let Unity WebApps always run in Chromium? How to uninstall unity webapps feature? How to maximise unity webapps?